Tom Koral Wins Event 55! 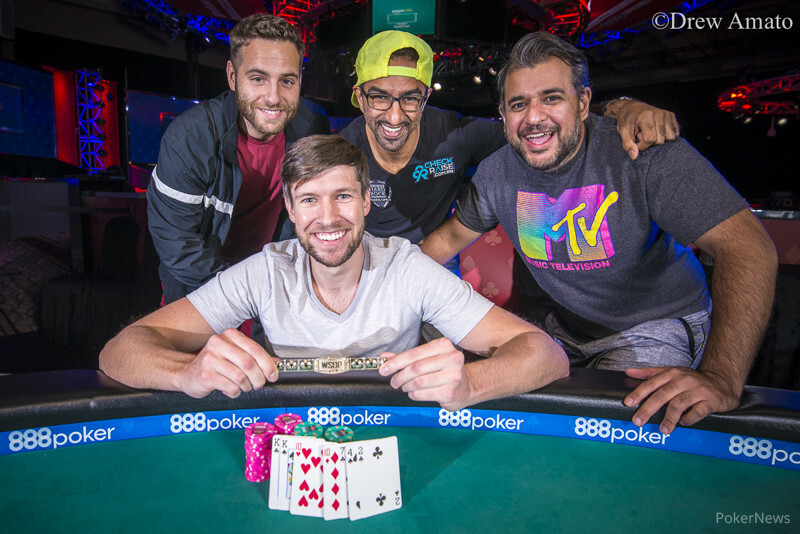 With 53 World Series of Poker cashes and five final tables to his name, Tom Koral was well aware of the challenges a poker player faces in their attempt to win a bracelet. With a chance to capture that elusive first one on Friday, Koral was solely focused on accomplishing that feat. When the last card was dealt and he had finally done it, Koral was both appreciative of the moment and reflective of the long journey he had taken to get here. 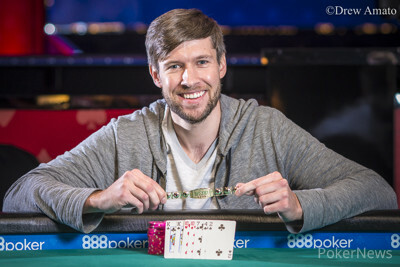 Koral's five final tables made at the WSOP are all in different events, so it goes to show just how well-rounded he is at his craft. In fact, Stud isn't even all that high on the list of what Koral feels he is best at. "In the H.O.R.S.E. lineup, it's probably my fourth or fifth best game. It's kind of ironic that I win my first bracelet in a game I feel I'm not as good at. Luck plays a very big factor in limit tournaments and I'm aware of that, and I'm very grateful, but I played my best. I definitely caught a really good run of cards heads up vs. him. With the way I was getting hit by the deck, it was going to be hard for him to win. I'm grateful for my luck and I'll take it and be happy with it. I'm just ecstatic that I won." Koral's road to victory in this 298-player field in Event #55: $1,500 Seven Card Stud was a smooth one to start. He bagged the ninth biggest stack of the 68 Day 1 survivors, and immediately rose to the top of the chip counts on Day 2. He maintained a top-five stack as the field dwindled and as the final table approached, but it was eventual runner-up Tsong Lin who had seized control entering the final table. Lin finished Day 2 with more than a third of the chips in play as he led the final seven players, while Koral had slipped and was sixth in chips. When Day 3 began it was more of the same, as within two hours Lin had doubled his stack. Koral had only moderately added to his, but with four players remaining Lin held 75% of the chips in play while Koral had just 12%. Eventually the two would meet heads up and Lin's control of the tournament looked to be insurmountable. Beginning heads-up play, Lin held a 17:1 chip lead. Fortunately for Koral, he was able to double up on the first hand. From there, Koral rode a hot rush of cards to even the match. "Lin played really really good for a guy that just plays cash and hasn’t played a ton of tournaments," Koral said. "He played really tough, but the one big advantage you have with Stud is that… in the Hold’em and Omaha games, you’re kind of forced to action because the blinds are so big in relation to the streets that you’re betting on later. So you’re always getting pot odds to call. But in Stud you basically are anteing, so you’re really not forced to play a big pot if you have enough chips, unless you want to. 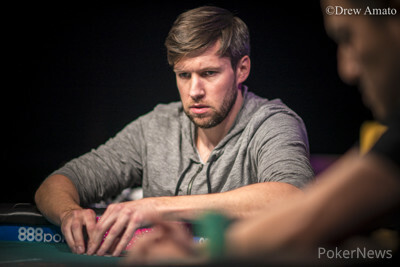 "So a big part of my heads-up strategy was playing very aggressively with the hands I was going to play and basically trying to punish him as much as I could for him opening too many hands, and I was hoping that would lead to him playing a little bit more passively heads up and giving me some extra antes and helping me win pots without hands. So my heads-up strategy was definitely full pedal to the metal if I had anything reasonable worth playing and put the pressure on him, and then hopefully I could get some folds later in the hand even if I didn’t catch so well. "You're going to have to get pretty lucky at some point, and you really have to just trust your reads all the way through, because the second you stop trusting your reads is when you're gonna get run over by an aggressive player." Koral's strategy worked, as he emerged victorious after the four-hour heads-up duel. His win also came one night after his friend and fellow Chicagoan Mohsin Charania won his first bracelet. "Chicago breeds a lot of really talented poker players. I think people in the midwest ... they work hard, they're driven. We work hard, we keep improving. Even in this tournament I was constantly running equities on different hands. I probably looked up 40-50 different stud hands over the last 2-3 days just to make sure I'm not making mistakes. If I did make a mistake, I realize when that situation comes up in the future so I dont make it again." "Even 13 years in I'm still trying to improve. " Tsong Lin completed, Tom Koral raised, and Lin went all in. Koral called and Lin was at risk, and behind Koral's buried tens. Koral made kings up on sixth street and Lin was drawing dead. Lin is the 2nd place finisher, taking home by far his largest tournament score for $59,894. Tsong Lin was the bring-in, Tom Koral completed, Lin raised, and Koral called. Lin bet fourth through sixth street, Koral called each time, then Lin checked on seventh street. 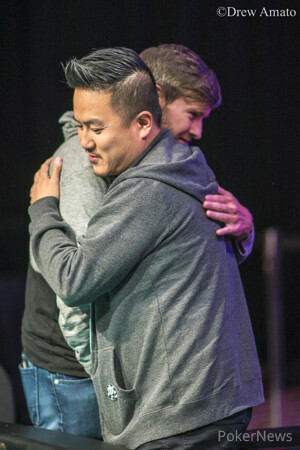 Koral looked at his seventh card and bet, resulting in a fold from Lin. Tsong Lin posted the bring-in and they checked all the way down. Lin showed for a pair of kings, good for the pot. Koral has around a 3:1 chip lead over Lin as the two take a one-hour dinner break. Play will resume at approximately 9:32 p.m.
Tom Koral completed and Lin called. On fourth street, Koral bet, and Lin called. They both checked fifth street and Koral check-called a bet from Lin on sixth street. On seventh street, Koral bet and Lin folded. Tsong Lin was the bring-in, Tom Koral completed, Lin raised, and Koral called. Koral checked on fourth street, Lin bet, Koral raised, and Lin called. Lin the took the on-board on fifth street and bet the rest of the way, with Koral calling him down. Lin showed for queens and nines, but Koral had it beat with for kings and sevens to win the pot. Tom Koral still holds a marginal chip lead over Tsong Lin.